I really like the background scenery and transition to the backdrop here. Simply beautiful. Well done job. and Don't weather that engine. Ok, I'll quit while I'm ahead. Just kidding. Marty is worried I'm getting ready to tear this out and move on, but I have no such plan. This is too much fun. No, I just want to you to wait until February of 2014 - that's what I picked in the pool . 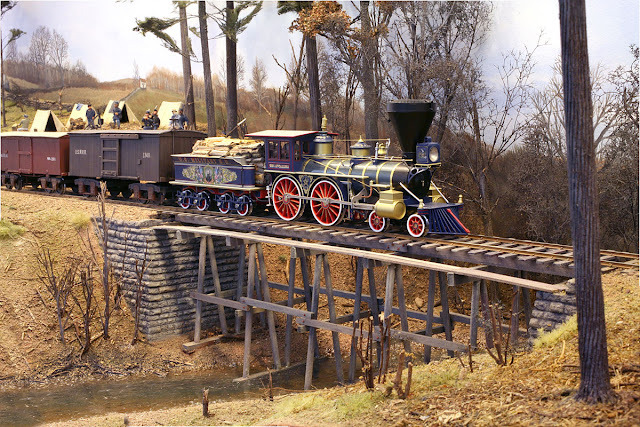 . .
Just to set the record straight CVSNE (aka Marty) has changed layouts three times in the period I have been working on the Aquia line.